The concept of tax expenditures seems simple on the surface. Tax expenditures are generally described as special preferences in the income tax system that reduce the taxes of certain individuals or activities. It is argued that, although operating on the tax side, they are similar to government spending programs in terms of providing selective benefits and that, also like spending programs, they may often be justified because of public policy benefits but should be regularly monitored and evaluated. Below the surface, however, the tax expenditure concept is complicated and often subjective. Numerous steps that frequently require difficult value judgments go into trying to identify and measure tax expenditures. With many tax provisions, it is clear whether or not they are tax expenditures, but with many others, including some of the large ones, the way the government classifies them is open to debate. As a result, while government-compiled lists of tax expenditures can sometimes be helpful in highlighting tax preferences, they are not the quick and simple shortcut to tax reform that many people expect or hope for. Here is the puzzle. Tax expenditures supposedly measure preferences in the income tax system, and many people assume they are almost synonymous with tax loopholes. But if that impression is correct, don’t the large tax expenditures received by higher-income taxpayers indicate they enjoy favorable tax treatment and pay relatively low taxes? How can the pattern of tax expenditures be consistent with IRS tax data demonstrating that the individual income tax is extremely progressive? The seeming disagreement between the distributions of income taxes and income tax expenditures is not due to any mistakes in the CBO studies; both are thorough and technically skillful. The resolution of the mystery comes in two parts. The next section of this paper provides some of the answer by comparing the fraction of total individual income taxes that various income groups pay and the fraction of total tax expenditures they receive. The rest of the paper will then look at income taxes and tax expenditures relative to people's incomes and explain why the progressive distribution of income taxes is largely hidden when one looks at the distribution of tax expenditures. This examination of tax expenditures is timely because there is much interest on Capitol Hill in giving up some tax expenditures in return for lower tax rates. 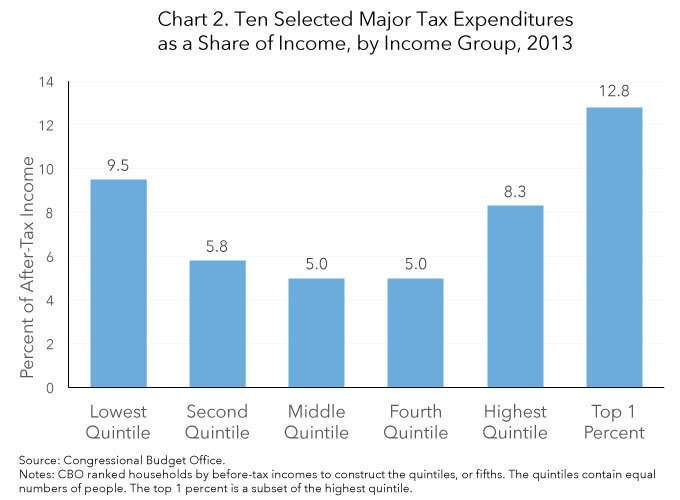 The CBO report on the distribution of ten major tax expenditures includes numerous tables and figures depicting the fraction of total tax expenditures going to different income quintiles. As seen in Chart 3, the fraction climbs from one quintile to the next, rising from 7.7 percent in the lowest quintile to just over half (50.6 percent) in the top quintile. To be clear, these ratios are looking at tax expenditures relative to the total amount of tax expenditures, not at tax expenditures as shares of people’s incomes. Viewed in isolation, this might give the impression that the individual income tax is least favorable for the poor, somewhat better for the middle-class, and much better for the wealthy. However, the CBO report on the distribution of taxes suggests the opposite is closer to correct. The report provides information on the fraction of total individual income taxes paid by different income groups. That fraction increases rapidly with income. As shown in Chart 3, it is negative in the bottom two quintiles (reflecting refundable tax credits; that is, checks from the U.S. Treasury delivered through the income tax system), while the top quintile makes 94.1 percent of total individual income tax payments. In addition, as explained below, because of how the tax expenditures listing is constructed, it is not an accurate guide to who pays how much in taxes. The tax expenditure concept originated with Stanley Surrey, a Harvard Law School professor who served as Assistant Secretary of the Treasury for Tax Policy during the Kennedy and Johnson administrations. Surrey claimed that, in theory, the income tax could be decomposed into a normal income tax and various additional provisions constituting tax subsidies or preferences. Surrey called the preferential items “tax expenditures” and regarded them as de facto government expenditures delivered through the back door. While acknowledging that many “tax expenditures” might be desirable and justified, Surrey urged the government to regularly publish a list of them so they would receive closer scrutiny. The term “tax expenditures” means those revenue losses attributable to provisions of the Federal tax laws which allow a special exclusion, exemption, or deduction from gross income or which provide a special credit, a preferential rate of tax, or a deferral of tax liability…. If tax favors were so obvious that one could reliably apply a “you’ll know it when you see it” rule, the definition’s vagueness and the lack of guidance would not be a problem. In reality, while many tax provisions are clearly special or preferential, the character of many others—some classified as tax expenditures and some not—is much less evident. The U.S. Treasury’s Office of Tax Analysis (OTA) and the staff of Congress’s Joint Committee on Taxation (JCT) currently prepare annual tax expenditure lists. The Treasury’s latest tax expenditures budget contains 169 items and the JCT’s has over 220. The JCT’s list is longer, in part, because it lists separately some items that the Treasury groups together, but the difference also reflects disagreements about how some income tax provisions should be classified. In constructing their baselines, the Treasury and the JCT have opted for an extremely broad definition of income known as Haig-Simons income. In 1938, Henry Simons proposed defining income as current earnings whether spent or saved, plus the change in the value of one’s existing assets. Haig and Simons noted that others had suggested a variety of alternative definitions of income. For example, a long line of economists including John Stuart Mill, Alfred Marshall, and Irving Fisher recommended defining income in terms of consumed income. It is beyond the scope of this paper to discuss the extensive literature evaluating the strengths and weaknesses of the Haig-Simons definition of income. However, it might be mentioned that Simons believed in aggressive income redistribution through taxation and thought a progressive-rate income tax, using his definition of income, was well suited to that end. The Treasury and JCT observe in their tax expenditure reports that their lists are sensitive to the income concept they select. For instance, a recent Tax Foundation examination found that about 60 percent, in dollar terms, of the items currently on the tax expenditures list are related to saving and investment and serve to lessen the current tax system’s bias against those activities. Most of those items would drop off the tax expenditures lists if the baseline were consumed income. Should the baseline measure capital gains in nominal dollars or inflation-adjusted dollars? Should the tax baseline measure capital gains as they accrue or when they are realized? Is it a tax expenditure or part of the baseline that tax brackets are wider and various deductions larger for married couples than for other filers? How should the progressive rate bracket schedule be handled? Should personal exemptions and the standard deduction be considered tax expenditures or part of the baseline? The last two questions are crucial in understanding why the distribution of tax expenditures differs so much from the distribution of income taxes. The Haig-Simons income concept deals with the tax base (i.e., what to tax); it does not specify tax rates. The Treasury and the JCT have made the judgment that the individual income tax’s progressive rate schedule should be treated as part of the normal tax structure. Hence, they do not count the low rates in the individual income tax’s bottom brackets as tax subsidies nor the high rates in the top brackets as special tax burdens. The Treasury describes the inclusion of the graduated rate structure in the baseline as one of “several major departures from a pure comprehensive income tax.” Simons was a vigorous proponent of income redistribution and approved of steeply rising rates, but perhaps the Treasury calls its treatment a departure because the below-average rates in the bottom brackets are, in fact, a tax advantage. For example, when the 2001 tax act split the old 15 percent bracket in two, the lower rate in the new 10 percent bracket clearly provided a tax benefit. Under Treasury and JCT procedures, that advantage does not count as a tax expenditure, even though it would count if exactly the same benefit were delivered through a tax credit, deduction, exemption, through a preferential rate on other income such as the 15 percent rate on qualified dividends, or through a government spending program. The Treasury and JCT procedures also mean that if Congress believes rates in the highest brackets are too harsh in some cases and enacts preferences to lessen the impact, the Treasury and JCT classify the preferences as tax expenditures without netting them against the high tax rates being partially offset. The inclusion of the progressive rate schedule within the Treasury and JCT baselines is sufficient by itself to explain why higher-income taxpayers appear to receive large tax expenditures but still pay a larger share of their incomes in tax than lower- and middle-income taxpayers. The Treasury and JCT are measuring tax expenditures as departures from a steeply progressive income tax in which the tax takes much more of people's incomes as their incomes increase. An oddity of the Treasury and JCT baselines is that an increase in the top rate brackets will tend to increase tax progressivity and, simultaneously, enlarge higher-income tax expenditures. In other words, increased income tax progressivity seems to make the tax expenditure problem worse. The explanation is that the amount of a tax expenditure equals how much is removed from the tax base times the rate at which it would be taxed. If the tax rate goes up and nothing else changes, tax expenditures also go up given how the Treasury and JCT compute tax expenditures. At the other end of the income scale, for taxpayers with low incomes, the income tax is already progressive because of its rate structure and tax expenditures further increase its progressivity. 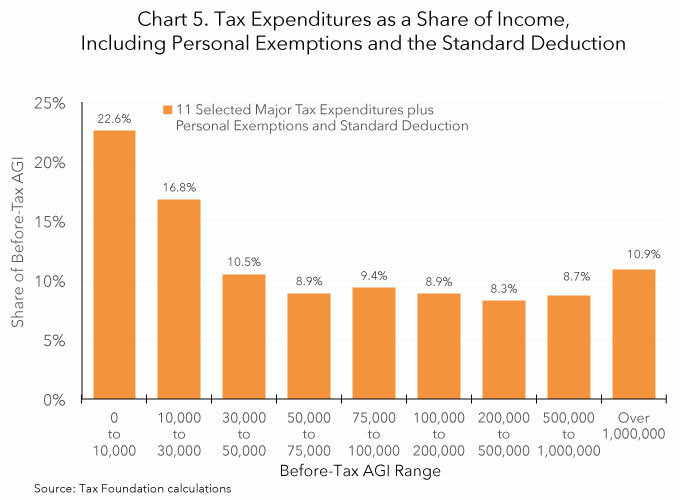 Personal exemptions and the standard deduction removed nearly $1.8 trillion of Haig-Simons income from the federal individual income tax in 2010. They amounted to 21.8 percent of the adjusted gross income reported on tax returns that year. They also greatly increased the income tax’s progressivity because they shielded from tax a much larger fraction of the incomes of lower- and middle-income people than the incomes of people with higher incomes. Nevertheless, the Treasury and the JCT classify neither personal exemptions nor the standard deduction as a tax expenditure. The Treasury notes, without explanation, that it includes personal exemptions and the standard deduction in the normal tax baseline. The JCT rationalizes that personal exemptions and the standard deduction are a rate bracket in disguise, stating that “the Joint Committee staff views… [them] as defining the zero-rate bracket that is a part of normal tax law.” More likely, the Treasury and JCT staffs do not count personal exemptions as tax expenditures because it is generally accepted that some amount of income “ought” to be tax exempt. Another rationalization might be that the personal exemption and standard deduction should be grandfathered into the normal tax baseline because they have been part of the income tax for so long. However, other tax provisions, such as the medical deduction, charitable deduction, state and local tax deduction, tax limitation on long-term capital gains, and the municipal bond exemption, are also long standing but are all listed as tax expenditures. Several itemized deductions have been part of the income tax since its inception in 1913, while the standard deduction was not added until 1944. Rosanne Altshuler and Robert Dietz have also questioned why personal exemptions and the standard deduction are treated differently than other exemptions and deductions and not counted as tax expenditures. They find the JCT’s and Treasury’s arguments unpersuasive and logically inconsistent. However, Altshuler and Dietz caution that efforts to identify tax expenditures based on the murky term “normal tax” are “inherently subjective.” They add that some or all of the lower rate brackets might also be considered tax preferences. The tax savings due to those reduced rates accrue primarily to low- and middle-income tax filers. Regardless of the JCT’s and Treasury’s reasoning, personal exemptions and the standard deduction are currently in the “normal” tax baseline. Consequently, the distribution of tax expenditures reflects none of the substantial progressivity they add to the individual income tax. Although personal exemptions and the standard deduction are not on the Treasury or JCT tax expenditures list, the discussion above suggests they probably should be. This is not meant in any way to disparage the provisions. On the contrary, personal exemptions and the standard deduction are the rare income tax features that truly promote simplification and comport with many people's notions of fairness, and their dollar amounts have been kept within reasonable limits. 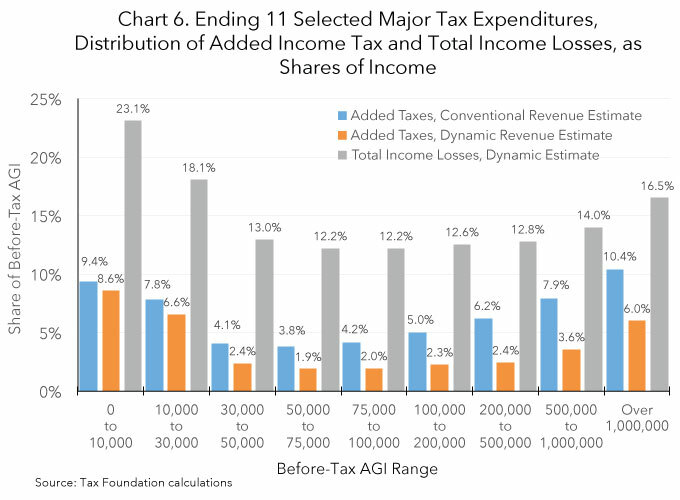 The Tax Foundation’s Taxes and Growth Model was used to estimate how the distribution of tax expenditures would change if personal exemptions and the standard deduction were included on the list. The results confirm that the apparent distribution of tax expenditures depends greatly on whether personal exemptions and the standard deduction are included or omitted from the baseline. For the estimation, eleven major tax expenditures were selected. They are the mortgage interest deduction, the property tax deduction, reduced tax rates on long-term capital gains and qualified dividends, the state and local income tax deduction, accelerated depreciation, the exclusion from taxable income of employer provided health care, the earned income tax credit, education credits, the child tax credit, the partial exclusion from taxable income of social security benefits, and the charitable deduction. Together, these eleven tax expenditures represent over half of the total value of all tax expenditures. The estimation procedures and presentation here differ in many respects from those employed by CBO. Four differences will be mentioned. The eleven major tax expenditures modeled here are not the same as the ten that CBO selected, although there is considerable overlap. This study relies on 2008 tax return microdata, while CBO had access to more recent data that was used to estimate 2013 tax expenditures. 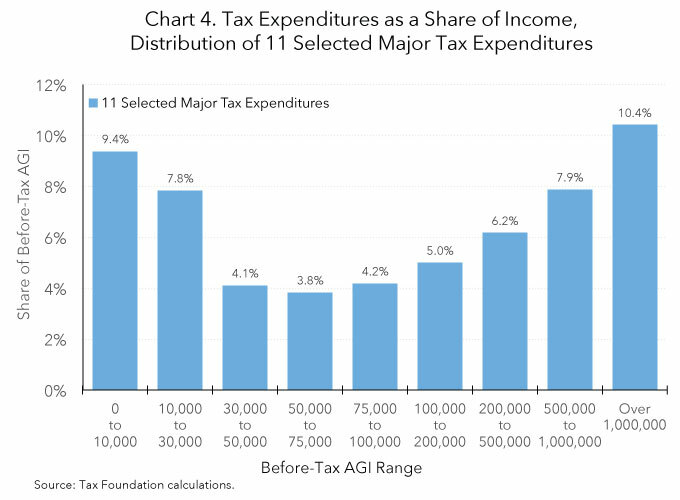 This study's distribution is for taxpayers divided into AGI ranges, while CBO's is for households divided into quintiles. This study took the ratio of tax expenditures to before-tax income, while CBO took the ratio of tax expenditures to after-tax, after-transfer income. One key similarity is that the estimates in this section rely on the conventional (static) revenue assumption that taxes do not impact economic growth. The static assumption is often unrealistic—tax changes can have powerful positive or negative growth effects if they alter marginal tax rates—but the assumption was made at this juncture to correspond to CBO’s static distributional estimates. Our Taxes and Growth Model was initially run with personal exemptions and the standard deduction in the baseline (i.e., not counted as tax expenditures). Because of the differences between the two models, the results here should not correspond precisely with CBO’s numbers, but they should display the same general pattern. As shown in Chart 4, the results at this stage do look similar to CBO's (in Chart 2), with the distribution of tax expenditures having the same U shape. For instance, the eleven tax expenditures modeled here equaled 9.4 percent of income for tax filers with AGIs between $0 and $10,000, 3.8 percent for tax filers with AGIs between $50,000 and $75,000, and 7.9 percent for tax filers with AGIs of $500,000 to $1 million. Indeed, the U is more pronounced in Chart 4 than in the CBO study. The next step was to add personal exemptions and the standard deduction to tax expenditures. Again, this is not suggesting that personal exemptions and the standard deduction are bad loopholes that ought to be curtailed, only that they are departures from a comprehensive Haig-Simons income tax and thus need to be on the tax expenditures list for the compilation to be impartial and logically consistent. Chart 5 illustrates the results. Compared to before, tax expenditures as a share of income jump sharply for filers with lower incomes because personal exemptions and the standard deduction exclude from tax such a large portion of their incomes. Tax expenditures also look much higher than before for middle-income filers, although not nearly as high as for lower-income filers. For higher-income filers, tax expenditures also look bigger than before, but the difference there is modest because the dollar amounts of personal exemptions and standard deductions are small relative to those filers' incomes. Further, many higher-income filers itemize, and those with the highest incomes have had their personal exemptions phased out. The distribution of tax expenditures no longer has a U shape. Instead, it begins high, falls through lower-middle incomes, and then flattens out over the rest of the income spectrum. For example, with the tax expenditure list modified to include personal exemptions and the standard deduction, tax expenditures equaled 22.6 percent of income for tax filers with AGIs between $0 and $10,000, 8.9 percent for tax filers with AGIs between $50,000 and $75,000, and 8.7 percent for tax filers with AGIs of $500,000 to $1 million. In short, with the outcome no longer baked into the cake, some of the individual income tax’s progressivity shows through. A serious shortcoming of the distribution charts presented so far is that they are based on the conventional revenue estimating assumption that tax changes have no macroeconomic growth effects. To be sure, a conventional analysis may allow some tax-driven shifts within the economy, such as less investment in one industry exactly offset by more elsewhere, but only if macroeconomic totals are unaffected. In reality, when tax changes alter after-tax rewards at the margin, people adjust the total quantities of labor and capital (equipment, structures, intellectual property, and inventory) they supply in production. The modified quantities of production inputs lead to changes in incomes and economic output. The macroeconomic effects also feed back on tax collections because taxes depend in large part on the size and strength of the economy. To be more realistic, the Taxes and Growth Model was run once more in the case of the eleven tax expenditures, this time allowing for tax-induced changes in the economy's size. The results are sobering. Most of the damage would come from repealing provisions that partially offset the income tax’s multiple biases against saving and investment, because capital formation is extremely sensitive to the after-tax rate of return. The smaller stock of capital is also primarily responsible for the adverse labor market effects. Less capital means less productivity, and productivity is the main long-run determinant of how much labor is worth and, therefore, how much it is paid. The model further estimates that the weaker economy would cut into tax collections, trimming the federal revenue gain to $179 billion ($319 billion more in individual income taxes but $138 billion less in other taxes, yielding a net change of $179 billion). For every extra dollar of federal revenue, the nation's output would drop by about $8.80. 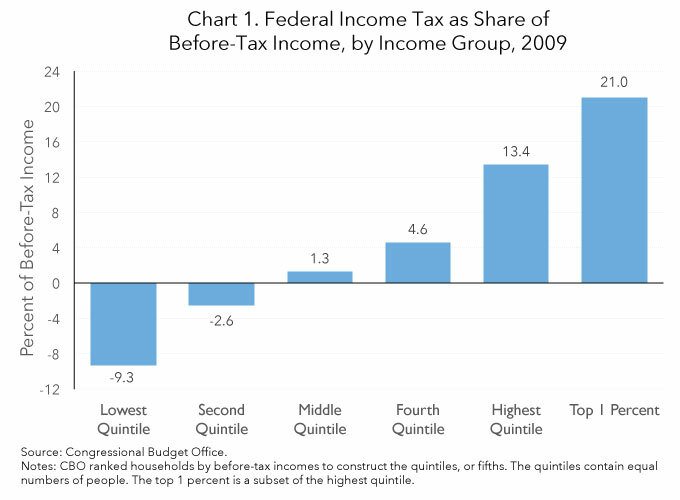 Chart 6 shows the distributional results. One set of bars displays the conventional tax expenditure estimates by income group (shown earlier in Chart 4). The next set presents dynamic estimates of individual income tax changes by income group. For all income groups, tax collections are lower than in the static estimates because the softer economy holds down tax collections. For example, the eleven tax expenditures equaled 8.6 percent of income for tax filers with AGIs between $0 and $10,000, 1.9 percent for tax filers with AGIs between $50,000 and $75,000, and 3.6 percent for tax filers with AGIs of $500,000 to $1 million. It should be stressed that what is holding down tax receipts is the tax-weakened economy. Chart 6 also includes a third series of bars, much higher than the others. It shows tax filers' losses of income due to both the broader income tax and the resulting weakness in the economy. An earlier Tax Foundation study had concluded that using the tax dollars from the base broadening to finance an across-the-board rate cut would lessen, but not fully correct, the damage. On the other hand, a plan that traded a broader base for lower rates likely would grow the economy if the tax expenditures being eliminated were not those that mitigate income tax biases against saving and investment. The federal individual income tax is steeply progressive: when people’s incomes rise, their income taxes increase much more rapidly. That progressivity is not visible, though, when one looks at the distribution of tax expenditures. The explanation for the disconnect lies in how tax expenditures are defined and measured. A major source of the income tax’s progressivity is its progressive rate schedule. However, that schedule, and the resulting progressivity, are already included in the hypothetical “normal” income tax baseline against which tax expenditures are measured. Hence, by construction, most of the income tax’s progressivity does not separately appear in measurements of tax expenditures. Two other powerful drivers of progressivity are personal exemptions and the standard deduction. They shelter from tax a much larger fraction of the incomes of lower- and middle-income people than the incomes of people with higher incomes. They are also in the baseline, which means the considerable progressivity they impart is similarly not reflected in the distribution of tax expenditures. One answer to the question of how the magician pulls the rabbit out of the hat is that the magician put the rabbit into the hat in the first place. So it is, to some extent, when looking at the distribution of tax expenditures. This study used the Tax Foundation’s Taxes and Growth Model to gauge the impact on the apparent distribution of tax expenditures if personal exemptions and the standard deduction were treated like most exemptions and deductions and listed as tax expenditures. The distributional effect would be dramatic, greatly raising tax expenditures as a share of income for lower- and middle-income tax filers. Congressional Budget Office, The Distribution of Household Income and Federal Taxes, 2008 and 2009 (July 2012), http://cbo.gov/sites/default/files/cbofiles/attachments/43373-06-11-HouseholdIncomeandFedTaxes.pdf. 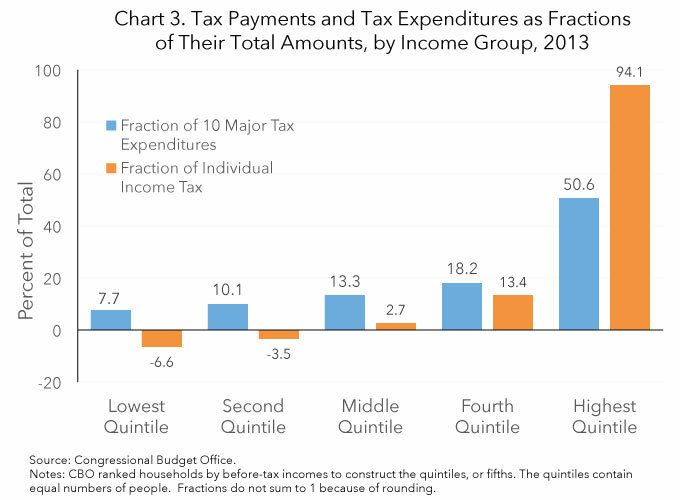 Congressional Budget Office, The Distribution of Major Tax Expenditures in the Individual Income Tax System (May 2013), http://www.cbo.gov/sites/default/files/cbofiles/attachments/43768_DistributionTaxExpenditures.pdf. CBO bases the tax payment fractions on 2009 tax data while the tax expenditure fractions are estimates for 2013. The difference in years does not appreciably change the comparison described in the text. William McBride, CBO: Tax Expenditures in the Eye of the Beholder, Tax Foundation Tax Policy Blog, May 29, 2013, https://taxfoundation.org/blog/cbo-tax-expenditures-eye-beholder. See U.S. Department of the Treasury, Annual Report of the Secretary of the Treasury on the State of the Finances, for the Fiscal Year Ended June 30, 1968, Exhibit 29.—Excerpts from Remarks by Assistant Secretary Surrey, November 15, 1967, Before the Money Marketeers, On The U.S. Income Tax System—The Need for a Full Accounting; and Treasury Department Report “The Tax Expenditure Budget: A Conceptual Analysis” (1969), http://archive.org/download/annualreportofse1968unit/annualreportofse1968unit.pdf. Office of Management and Budget, Analytical Perspectives: Budget of the U.S. Government, Fiscal Year 2014 (2013) at 241-242, http://www.whitehouse.gov/sites/default/files/omb/budget/fy2014/assets/spec.pdf [hereinafter Analytical Perspectives 2014]. See Analytical Perspectives 2014, supra note 8, at 241-277. See also Joint Committee on Taxation, Estimates of Federal Tax Expenditures for Fiscal Years 2012-2017, JCS-1-13 (Feb. 1, 2013), https://www.jct.gov/publications.html?func=download&id=4504&chk=4504&no_html=1 [hereinafter JCT Estimates]. The list includes provisions affecting individual and corporate income taxes, but tax expenditures on the individual side are much larger, about 90 percent of the total dollar amount. Henry C. Simons, Personal Income Taxation: The Definition of Income as a Problem of Fiscal Policy 50 (University of Chicago Press 1938). See also Robert M. Haig, The Concept of Income—Economic and Legal Aspects, in The Federal Income Tax (Robert M. Haig ed., Columbia University Press, 1921). Simons declared that his advocacy of highly progressive taxation was ultimately based on moral and aesthetic considerations. “The case for drastic progression in taxation must be rested on the case against inequality—on the ethical or aesthetic judgment that the prevailing distribution of wealth and income reveals a degree (and/or kind) of inequality which is distinctly evil or unlovely….” Simons, supra note 10, at 18-19. Several years ago, the U.S. Treasury examined the dramatic changes that would occur in which provisions it classifies as tax expenditures if the baseline were comprehensive consumption. See Office of Management and Budget, Analytical Perspectives: Budget of the U.S. Government, Fiscal Year 2009 (2008) at 287-328, http://www.whitehouse.gov/omb/budget/fy2009/pdf/spec.pdf. See William McBride, A Brief History of Tax Expenditures, Tax Foundation Fiscal Fact No. 391 (Aug. 22, 2013), https://taxfoundation.org/article/brief-history-tax-expenditures. However, the Treasury and JCT usually do not count special surtaxes, such as the new 3.8 percent surtax on investment income for certain high-income taxpayers, as part of the baseline. See Analytical Perspectives 2014, supra note 8, at 242, 257. As a simplified example, suppose the statutory rate in the top bracket is 35 percent, and an item listed as a tax expenditure reduces taxable income by $100. The tax expenditure would be $35. If the rate in the top bracket is now raised to 39.6 percent, the tax expenditure would instantly jump to $39.60, even though people in the top bracket would now be paying more income tax than before. See Internal Revenue Service, SOI Tax Stats – Individual Income Tax Returns, Table 1—Individual Income Tax, All Returns: Sources of Income, Adjustments, Deductions, and Exemptions, 2010, http://www.irs.gov/file_source/pub/irs-soi/10in01ar.xls. See Analytical Perspectives 2014, supra note 8, at 242. See JCT Estimates, supra note 9, at 3. See Individual Income Tax Act of 1944, P.L. 78-315, § 9. Three years earlier, the Revenue Act of 1941, P.L. 77-250, § 102 had allowed some taxpayers use an optional tax table that implicitly included the equivalent of a standard deduction. Rosanne Altshuler & Robert Dietz, Reconsidering Tax Expenditure Estimation, 64 National Tax Journal 459-490 (2011). A technical note is that some exemptions and deductions should not be considered tax expenditures because they represent costs incurred in generating income. The costs of producing income need to be subtracted out in order to correctly measure income, which is a net concept. The discussion in the text concerns exemptions and deductions that are not based on costs of producing income. See U.S. Department of the Treasury, Annual Report of the Secretary of the Treasury on the State of the Finances, for the Fiscal Year Ended June 30, 1968 (1969) at 340. The Treasury produced this study on its own initiative; the 1974 legislation mandating the report was still several years in the future. See JCT Estimates, supra note 9, at 2. Current-law individual income taxes were calculated in the model for each tax filer. The eleven selected large tax expenditures were then assumed to be eliminated and individual income taxes recomputed for each tax filer. The difference between the current-law and simulation numbers is the estimate of the combined tax expenditure for the eleven provisions, by tax filer. 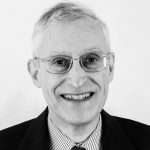 See Michael Schuyler & Stephen J. Entin, The Economics of the Blank Slate: Estimating the Effects of Eliminating Major Tax Expenditures and Cutting Tax Rates, Tax Foundation Fiscal Fact No. 378, July 26, 2013, https://taxfoundation.org/article/economics-blank-slate-estimating-effects-eliminating-major-tax-expenditures-and-cutting-tax-rates; the eleven case studies to which the previous paper provides links; and Michael Schuyler, The Effects of Terminating Tax Expenditures and Cutting Individual Income Tax Rates, Tax Foundation Fiscal Fact No. 396, Sept. 30, 2013, https://taxfoundation.org/article/effects-terminating-tax-expenditures-and-cutting-individual-income-tax-rates. The runs described above on eleven selected tax expenditures include most Schedule A itemized deductions. The runs that count personal exemptions and the standard deduction as tax expenditures add all other Schedule A itemized deductions with one exception. The exception is the miscellaneous business expense deduction, because costs of producing income are not tax expenditures according to the Haig Simons definition of income. For a fuller discussion of this case, see Michael Schuyler, The Effects of Terminating Tax Expenditures and Cutting Individual Income Tax Rates, Tax Foundation Fiscal Fact No. 396, Sept. 30, 2013, https://taxfoundation.org/article/effects-terminating-tax-expenditures-and-cutting-individual-income-tax-rates.